Not to be confused with the game of the same name by Firebird in 1984, Circus Circus was to be a new game from Martech in 1989 on the Spectrum, C64 and Amstrad platforms. The game would feature a series of events including Lion Taming, High Diving, Trapeze work and was due for release in November/December time of that year. 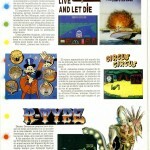 The game on the Spectrum was being developed by Creative Reality, who had previously done Rex for Martech. Sadly it was never to be, and apart from a demo released for the Spectrum – nothing of the other formats ever surfaced as Martech went under even before the Spectrum version could make it out. It is believed that Circus Circus on the C64 may have had no development even started due to similar reasons to Rex, where Martech had no C64 programmers to hand and were looking to move to the 16-bits. It’s early days yet!